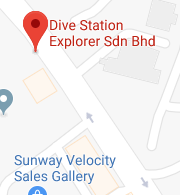 Due to the Renovation Closure of 3rd Floor Mid Valley Megamall, Dive Station Explorer will be Operating from Beltif Hotel, Kuala Lumpur. We will be back in Mid Valley Megamall from October 2014 onwards. For any further assistance, kindly contact us at 017-260 2775 or send us drop by us an email by using the contact form here.